Here are some of our signage categories. 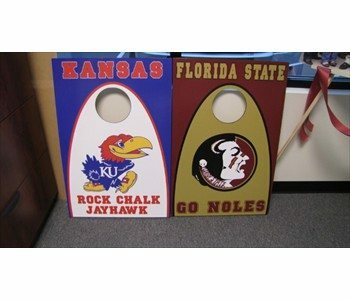 We can develop and produce many different types of signs. If you don’t see a specific type of sign listed on our website, give us a call or fill out the form below with details; we can work with you to create a custom solution to fit your business. 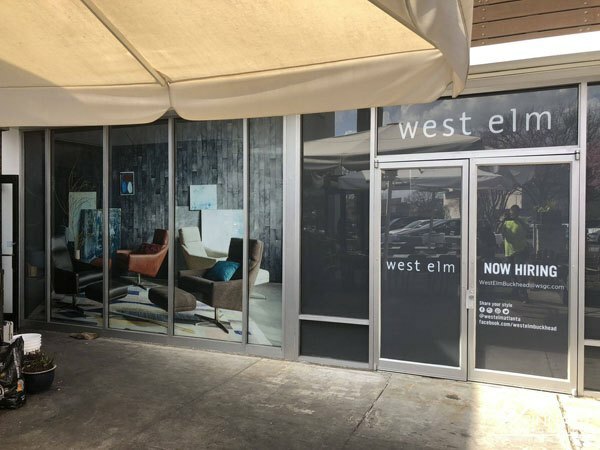 Take a stroll through any new retail development and you’ll quickly notice just how far the sign industry has advanced. Today, options are more flexible, creative and attainable than ever, allowing any business, on any budget, to purchase stunning, attention-grabbing signage. If you’re in the market for a new sign, give us a call and let us know what you have in mind. 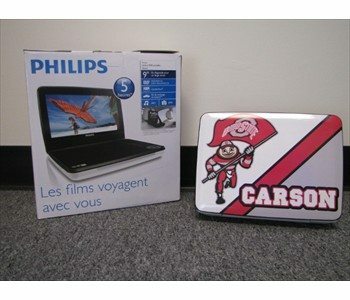 We can customize any product to your specific needs, and we’re adding new, exciting products all the time. We can produce many different types of signage and have listed many of them on our website. If you don’t see a specific type of sign that you need, give us a call or fill out the form below with details; we work with you to create a custom solution to fit your business needs. If you’d like for us to contact you about your signage needs, please complete the form below. 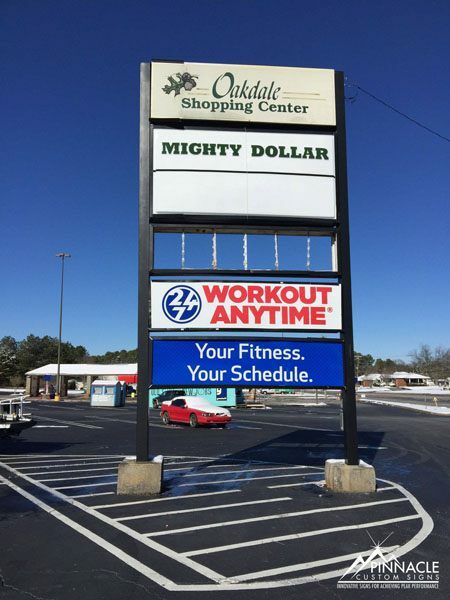 Or, you can call (678) 714-8700 and let us see how we can help you with the perfect sign for your need. For more images of our work, please visit the signage category pages to view related images. 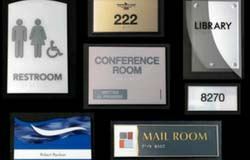 Signage helps your business address some significant business challenges. From marketing your business to making sure your location is safe and accessible, signs play an important role in your business’s day-to-day activities. Branding your business is key to helping customers remember your business when they need your products or services. Your brand is what identifies you and makes you different from everyone else. It includes your logo, business colors, and so much more. Consistency is key in building brand identity. Think of the major brands, like Coca-Cola or State Farm – you can quickly and easily identify them and their branding. Coca-cola is refreshing; State Farm is like a good neighbor who’s there to help you. These connections are nearly instant in our minds because we’ve been exposed to consistently branded messaging from those companies. Similarly, you need to build consistent brand awareness. We help businesses by taking their branding and applying it to signage that they need. You may think that this is a simple process but it’s not. We look at the type of sign that you need – the size, location, and building codes – and then work with you to create a sign design that matches your branding while using materials that stay within your budget. How often do you take for granted wayfinding and compliance signage? These types of signs are easily overlooked because we have become accustomed to them. Why are wayfinding and compliance signs important? Wayfinding signage helps guide you to where you need to go – in office buildings, hospitals, schools, malls, etc. You’ll most often find people commenting about wayfinding signage when they get lost or are confused about where to go. Also called directional signage, this type of signage is essential to building campuses and needs to be thoroughly planned out prior to creating any signs. Compliance signage can mean signs that inform you of where the emergency exits or bathrooms are or signs that direct you to handicapped services, like handicapped doors, bathrooms, and other essential services. 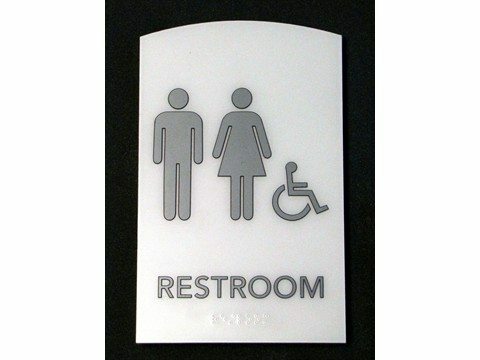 These signs are mandatory for a building to have and are usually enforced by Federal or State building codes. Let’s talk about something you may not be fully aware of – ADA Design Standards. American With Disabilities Act created sign regulations that help individual with impairments to be able to have equal access to public areas. This includes regulations on the height of signs, the incorporation of braille and raised lettering, using pictograms, the reflectiveness of the signs (reducing glare), and much more. You are an expert in your business; we are sign experts. We know the regulations and requirements and can help you design, manufacture and install directional and handicapped signage. Actively engaging with potential customers is key to getting them to take action (ie. buy your product or hire your services). One way to do that with minimal effort is with engaging signs. Signs can be used to engage with visitors in a variety of ways. First, think about your messaging; how do you want to engage visitors. It could be with and inspirational quote, an image of your product, a benefit statement, or more. Then think about placement and design. 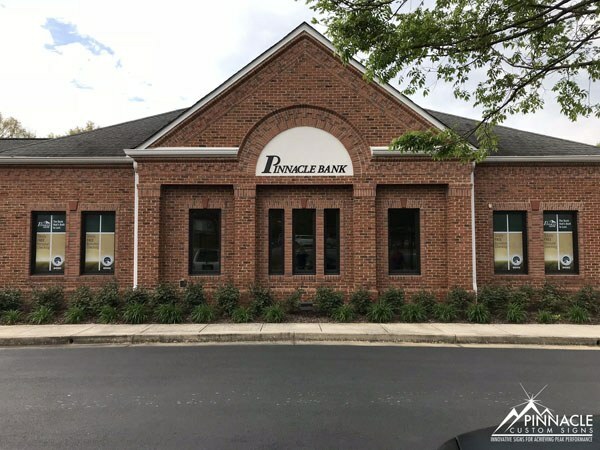 Depending on your location, you may have the ability to install window graphics or wall graphics, put up banners, or other types of signage. Once you have a placement, then you design your message using key design practices – the use of color, graphics, and typography. Here are some examples. 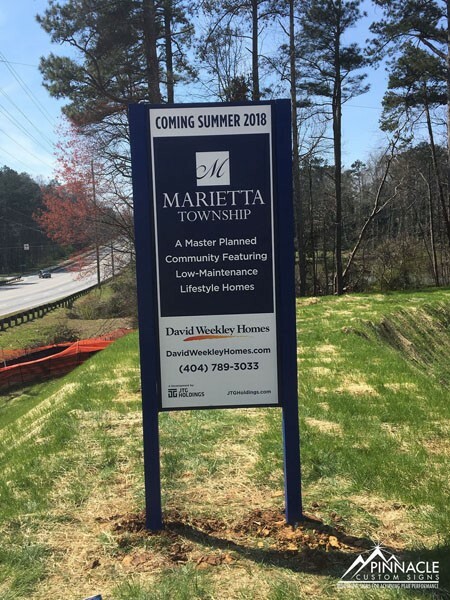 A real estate company can place a series of signs at the entrance to a neighborhood that highlights the benefits of living there, like a pool, tennis court, etc. A dentist could use window graphics to highlight happy customers and the services he provides. A corporate office could use wall graphics to highlight the business’ mission, values, or an inspirational quote. Informing your visitors is similar to engaging with them, but it usually is focused slightly differently. For instance, you can put up “Coming Soon” or “Grand Opening” banners or signs to let people know when your business will be open. You might want to let them know about special promotions or sales. Informational business signs tend to be temporary signs that are easy to change, like window graphics, banners, or changeable copy signs. Non-business informational signs are frequently used to inform a visitor about a particularly area, often about the history or use. For instance, a sign at the start of a hiking trail may detail what hours are safe to walk the trail and what to be aware of (ie. bears). Many different types of signs can help promote your business, including the ones we’ve already mentioned. Some other types of signage that can help are billboards, vehicle wraps, trade show displays, etc. Just remember – keep your branding consistent. No matter what your signage needs are, we can help you achieve them. We offer a range of services to meet every business need. From on-site surveys to design to manufacturing, installation, and maintenance, our team of sign professionals can help you with any signage project. 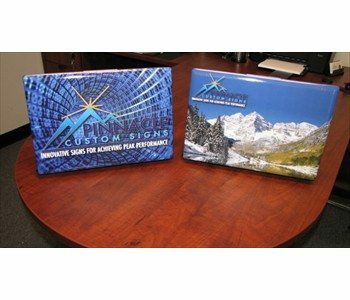 Pinnacle Custom Signs specializes in the design and production of a wide range of signage; they haven’t met a project that they could not tackle. Because of their skill and production ability, they are a one-stop-shop for all of a business’s signage needs. Below are some types of signage that are not listed on other pages of our website. Signs are not just important outside your building. 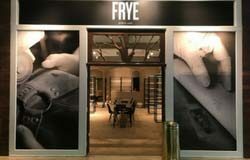 Indoor signage is just as important for your employees as well as to visitors to your business. They can direct people to the right office or conference room. Or, a well-placed wall graphic can set the mood for your office space. 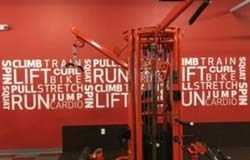 We can help dress up your office space, help with office identification, provide graphics that tell your story or create a truly unique wall covering. 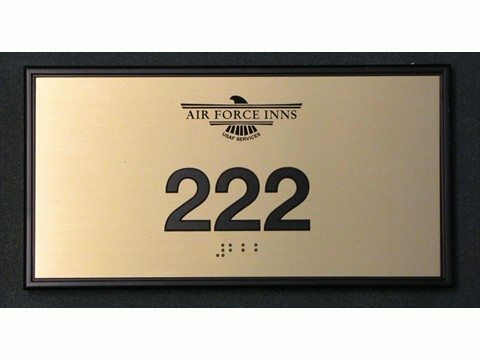 Below are examples of interior signs that we’ve created for some of our customers. 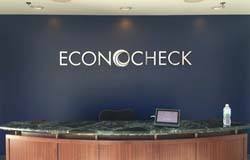 If you’d like more information, or would like to get a quote for your interior signage project, please click here. Promote your properties and increase drive by traffic with our custom real estate signs. As a real estate agent, your sign is your business card, and it’s important that it be visible, durable and easy to read. Custom real estate signs add a touch of professionalism to your properties. 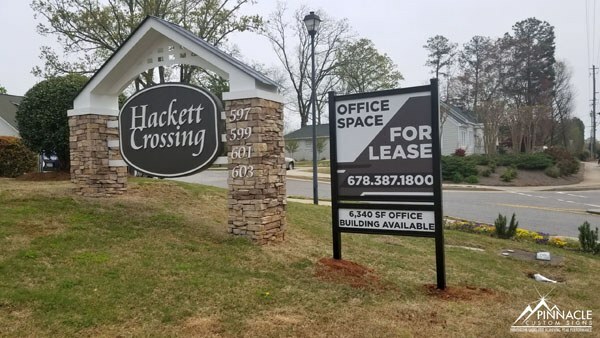 We understand that and are ready with a complete range of all-weather real estate signs from economical corrugated plastic yard signs to heavy-duty, metal-framed signs. We can also create custom designed riders which can be used to enhance or give additional information for the property, such as a contact phone number, a listing number or special pricing information. Want that sign to show up, even after dark? We can create your sign with reflective vinyl that will shine as cars drive by, keeping your message bright and clear, even when the sun goes down. Simply choose the style you prefer, tell us what you would like to have on it, and we’ll create it for you. You can even add your photo for a personalized touch. If you’re in the commercial real estate business—whether you own, manage or build—you’ve probably seen your fair share of commercial property signs. Generally used to advertise lease space, exhibit company information at construction sites or announce new developments, these large signs grab attention by their sheer size. Whether it is a standalone unit, or a multi-tenant property, we work with you to understand your business need and to advise you with the best ways to advertise your available space. We use a variety of materials to create your commercial property sign, which can be built to display on one or both sides. Most of these signs are printed on 4’ x 8’ or 4’ x 10’ panels, with a choice of vinyl lettering or digital graphics. Our signs are made with the highest quality materials and will last as long as the property is on the market. If installation is needed, we can handle that as well. 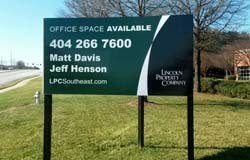 When you start to think big with a commercial property sign, give us a call and we’ll help you get it done right. 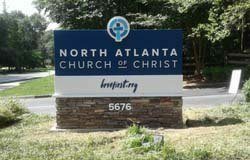 While the majority of signs we produce are what you typically think of as a sign, there are occasions when we have created some not-so-typical signs. 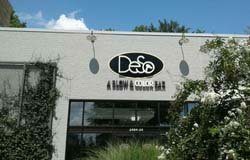 If you have an idea for an “outside the box” type of sign, give us a call and let us see how we might be able to help.